I recognized the Guest House at Graceland’s shuttle a quarter mile away as it arrived at the Memphis airport the afternoon of June 18. The vehicle that pulled up to take us aboard had Elvis Presley’s likeness plastered all over it. I was in town to immerse myself in all things Elvis for a few days, and my wife was there … well, just because she’s a good sport and came along to keep me company. I had last been to Memphis a decade ago, when I had a booth at Elvis Expo to sell copies of my new book, “Elvis ’57: The Final Fifties Tours.” I spent most of Elvis Week 2008 in the downtown hotel that housed the Expo, but one afternoon before leaving town, I made my way over to Graceland for the standard tour of Elvis’ home. As interesting as it was, I felt no need to return for another visit … that is until recent changes along Elvis Presley Boulevard drew me back this year. 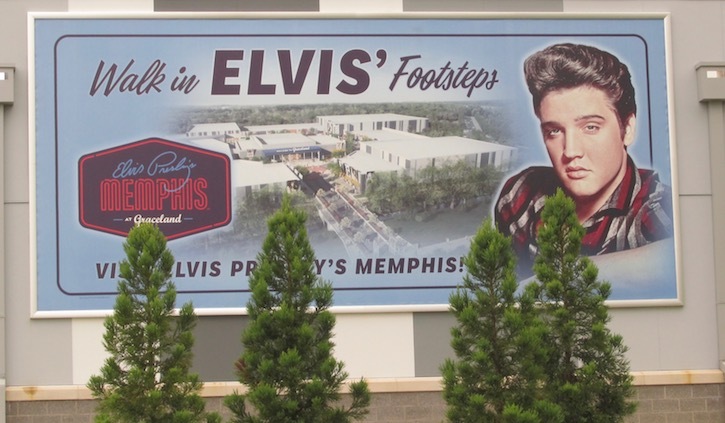 The Guest House opened in October 2016, followed four months later by “Elvis Presley’s Memphis,” described in Graceland press releases as a 200,000 square foot entertainment and museum complex. My Elvis emersion began during the 10-minute ride to The Guest House. Elvis music played softly in the shuttle, as it would everywhere we went over the next few days. It played quietly in all the hotel’s public areas, including the restaurants and the swimming pool area. 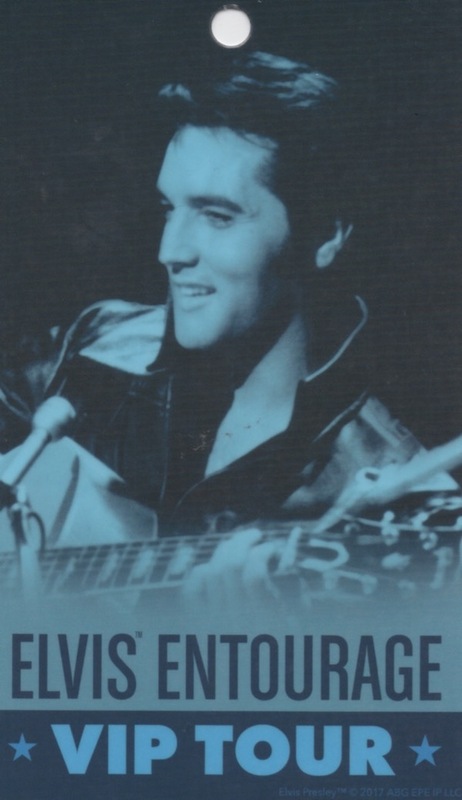 It played in Graceland, in all the Elvis Presley’s Memphis exhibits, and in all the complex’s gift shops. The airport shuttle driver introduced us to another recurring Graceland-area theme—courtesy. 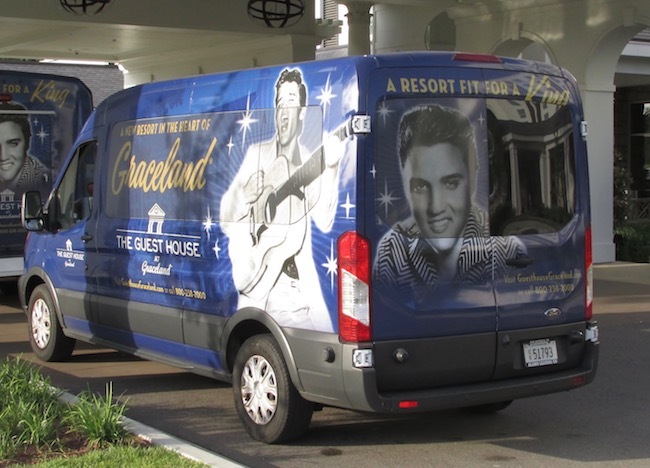 Every employee we encountered at The Guest House and the Graceland facilities matched the driver’s attentiveness. 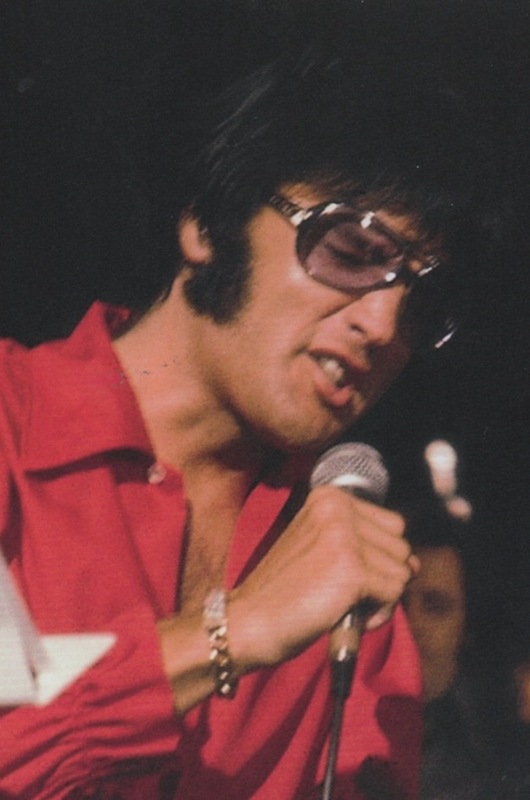 It was as if they knew Elvis addressed people as ‘mam’ and ‘sir,’ and they resolved to do the same. While The Guest House at Graceland is gracefully designed, it is not overly so. Elvis’s name is everywhere, but outside of the gift shop, it’s as if his image is forbidden. Framed iconic images of Presley symbols decorate the halls and guest rooms, but Elvis memorabilia and photos are nowhere to be seen. 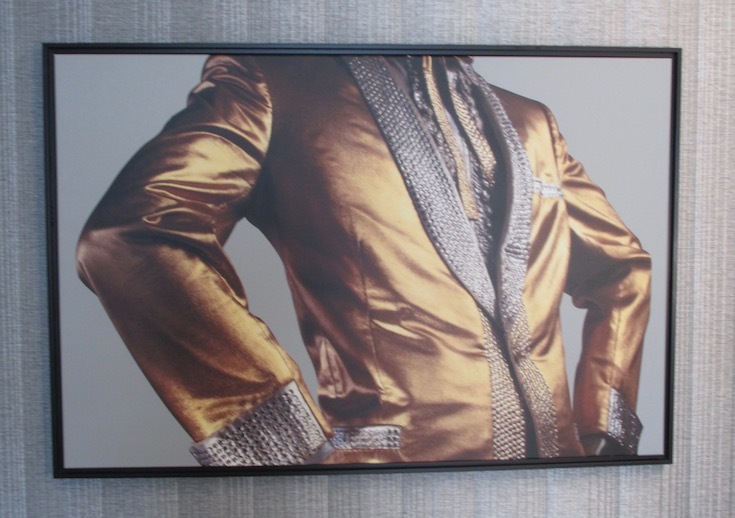 In our room, only an artist’s rendering of Elvis’s gold lamé suit adorned the walls. The hotel’s decorators obviously decided not to overwhelm guests with Presley relics. That would occur in Graceland itself and in the museum complex. 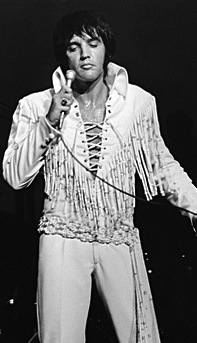 The hotel provided several Elvis related activities for guests. Every night at 7 p.m., a different Presley movie or TV special played in The Guest House Theater. We sat in on the Monday evening offering, “Viva Las Vegas.” Neither the picture nor sound quality matched that of a commercial theater, but still it brought back memories of seeing that classic film in its initial theatrical run back in 1964. Two Saturday nights each month, the evening film is shown outdoors on the hotel’s event lawn. Unfortunately, our stay didn’t include one of those Saturdays. However, we were able to stop by the free “Peanut Butter & Jelly Station,” which is set up in The Guest House lobby nightly between 10-11 p.m. This event, of course, honors Elvis’s late night appetite for peanut butter and banana sandwiches. Sliced banana is among the many toppings The Guest House provides for guests to put onto their peanut butter sandwiches. 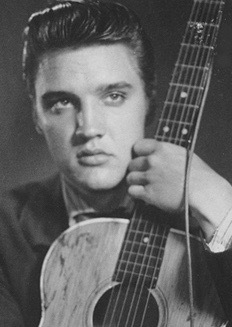 Being an Elvis purist, I piled banana pieces on my sandwich, but one bite was all it took before I decided to discard the rest of that sandwich. Of course, the sandwiches Elvis enjoyed so much were deep fat fried, which I’m sure made them much tastier than the one I made that night at The Guest House. After breakfast at Delta’s Kitchen on Tuesday, June 19, Chris and I caught the hotel’s 9:30 a.m. shuttle to Graceland’s Ticket Office for our scheduled 10 a.m. Graceland tour. Across the street from Graceland, the ticket office is the point of entry to a large complex of buildings just a couple of blocks down Elvis Presley Boulevard from the hotel. The parking lot is so large that it creates the feeling of approaching an amusement park. Climbing the steps to the ticket office, we entered an expansive space fully 10 times larger (it seemed) than the Graceland ticket office of a decade ago. A half dozen ticket windows with stanchions and tape keep customers in orderly lines. To the right is the first of many gift shops patrons will encounter before the day is over. To the left, ticket holders queue up for the Graceland shuttles. On that day, the parking lot was about only a tenth full, and the ticket lines moved quickly. 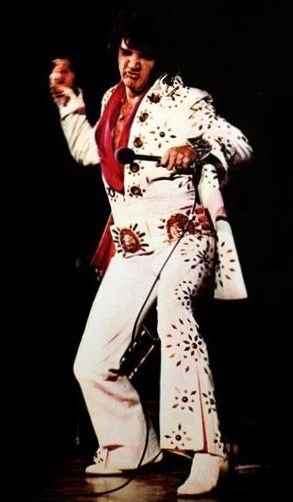 Later in the summer, though, and especially during Elvis Week in August, I could imagine a sea of cars and tour buses in the lot and long lines everywhere in the ticket office and in the gift shops. 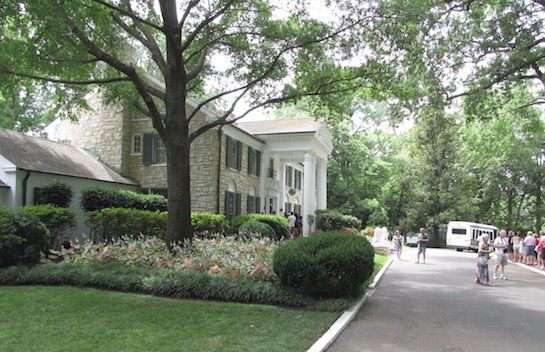 Still, I was impressed by how many people were visiting Graceland in mid-June. No matter what level of ticket purchased, everyone’s Graceland tour started with viewing a short video. For some reason, there were three different video rooms. The “Mansion-Only” group was directed into “Studio A,” while others with more expensive tickets were herded into “Studio B.” Both studios were located in the ticket office. Those like us with VIP tickets were escorted to a “VIP shuttle,” which carried us in style (actually it was the same kind of shuttle as all the others) across the street to Graceland. Stepping off in front of the mansion, our group was directed to walk around to the left side of the building, where we entered a dark ground level room to watch our video. The only objects in the room were a viewing screen with an overhead projector and some benches. I imagined that the room must have been used for storage space of some kind in the past, but it was a bit cool to think we had been in a Graceland room that only a pampered few had been allowed to see. On the way back to the front door, we were armed with iPad’s loaded with a self-guided tour narrated by actor John Stamos. Unfortunately, no directions were provided on how to operate the programmed tour, and if it weren’t for my computer-savvy wife, I would never have figured out how to control the pace of the narration. Some patrons were obviously confused and scurried along trying to keep up the Stamos’s commentary. While many of Graceland’s living areas were the same as I remembered them, there were some major changes. Most of the archival items, such as the gold lamé suit and the gold records had been moved across the street to the museum complex. The handball court, for instance, which was crammed with jump suits during my last visit, now appears as it did when Elvis played handball there on the last night of his life. The only exhibit remaining is a nicely done double hallway detailing the history of Graceland. 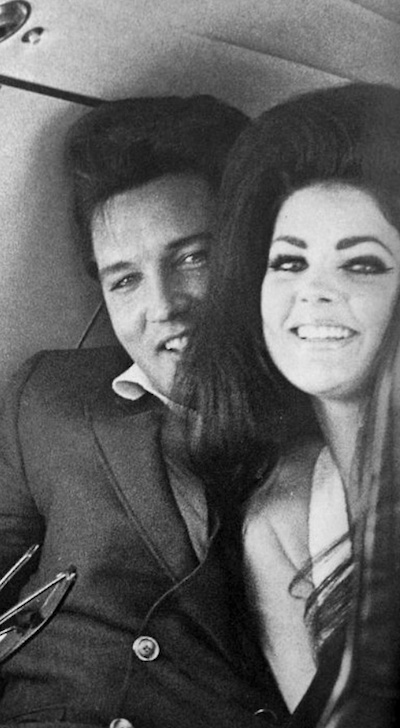 Included are the mansion’s deed, photos, checks, letters, and other documents dating back to Elvis’s purchase of the property in 1957. The highlight of my tour of Graceland this year was viewing Vernon’s office in back of the mansion. I’d seen it 10 years ago, but since then I’ve read Becky Yancey’s book about her years as a secretary in the office from 1962-1975. An old wellhouse was then, and is still, attached to the side of the office building. Becky recalls a day when, without warning, Elvis and his guys started blasting away with .357 magnum pistols at a target on the wellhouse door. As I stood in Vernon’s office, I could imagine Becky scrambling under her desk as wooden chips from the wellhouse door showered the office. 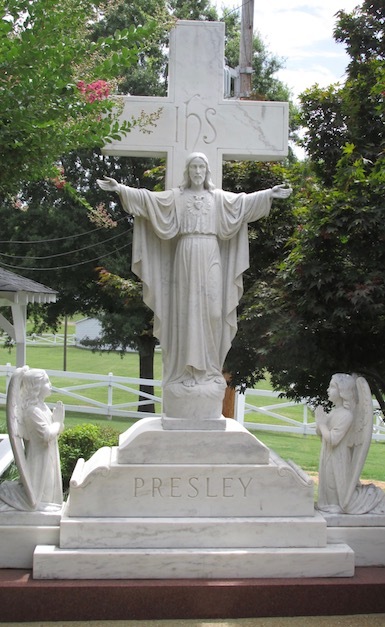 Of course, the tour still concludes in the Meditation Garden, where guests are invited to remain as long as they wanted in communion with Elvis, Gladys, Vernon, and Minnie Mae. As a “VIP” ticket-holder, Chris and I could have returned to the front door and gone through the mansion again, but I was anxious to get back across the street to see the “Elvis Presley’s Memphis” exhibits. After all, more than Graceland, it was this expansive Elvis museum that drew me back to Memphis this year. 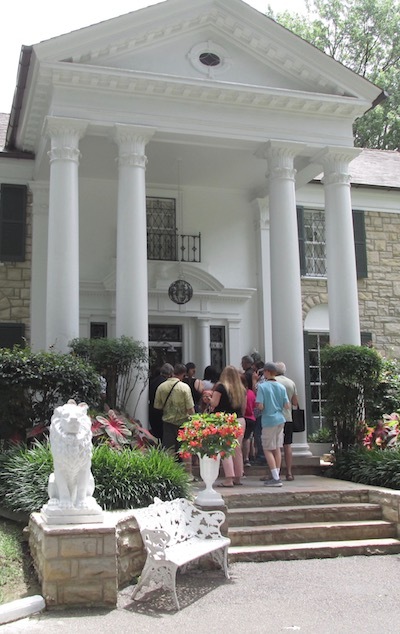 Although it’s not listed as an option on Graceland’s website, it is possible to skip the mansion tour and buy an Elvis Presley’s Memphis-Only ticket onsite in Memphis. 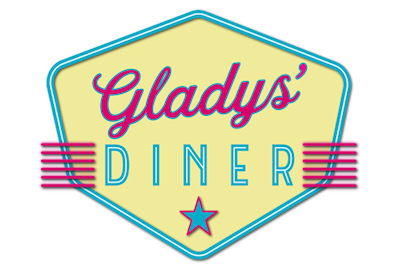 That might be a good option for those who have seen Graceland several times before. The $38.75 cost of getting into the exhibits is well worth it. Getting to the "Presley Cycles Exhibit" required first passing through an Elvis auto-cycle themed gift shop. 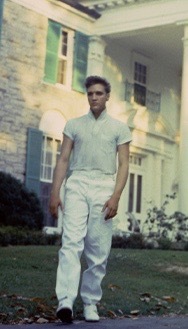 (It’s a clever Graceland ploy used twice more in the museum complex.) I gave Elvis’s motorcycles a cursory look and headed for the door leading to the next exhibit. I was looking forward to the "Archives Experience," as Graceland’s website promised it provided a “glimpse into the Graceland Archives as you explore hundreds of artifacts from our collection.” On entering the room, what looked like dozens of archival boxes could be seen stacked on storage shelves. Stepping forward, I prepared to take the lids off of some boxes and see what was in there. The reality, though, was that the entire collection of boxes was behind a thick panel of glass. Obviously, the boxes, which were all probably empty, was just a replica of the real archives collection located in a secure location elsewhere. Pullout drawers in several filing cabinets housed the only artifacts that were actually available for inspection. Although many of the items, which included documents, vinyl records, buttons, and so forth, were interesting, they were made a little less so by nearby signs informing viewers that all of the items were reproductions. The "Private Presley" exhibit in the next room was more to my liking. Large photos of Elvis during his army years covered the walls. A video told the story of his induction in 1958 through his discharge in 1960. Documents and other photos in cubicles were available for inspection. 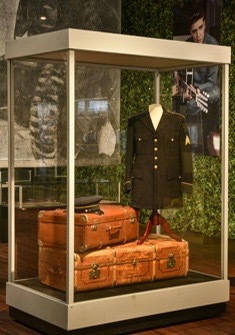 A display case housed his army dress uniform. All in all, the exhibit is a pleasing recounting of the two years Elvis spent in the service of his country. The "Icons: The Influence of Elvis Presley" exhibit in the next room is impressive in appearance but low in relevance. 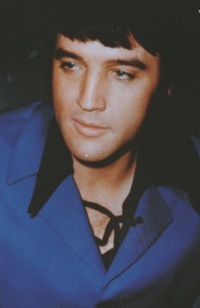 A couple dozen large display cases enclose life size figurines, photos, and memorabilia of entertainers, past and present, who the exhibit’s title suggests were influenced by Elvis. 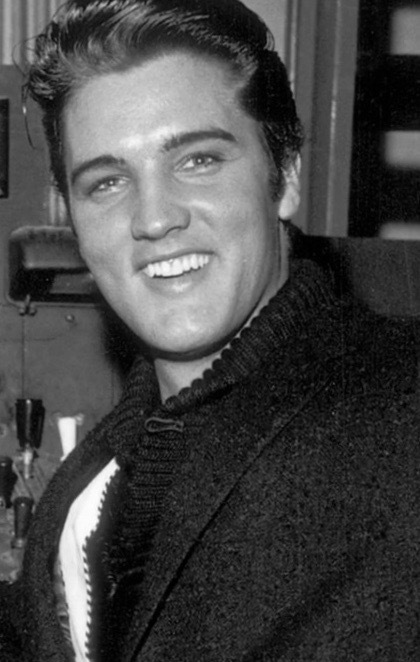 Most of the cases contain a quotation praising Elvis, but beyond that there is no evidence provided that Elvis ever “influenced” all of these people. 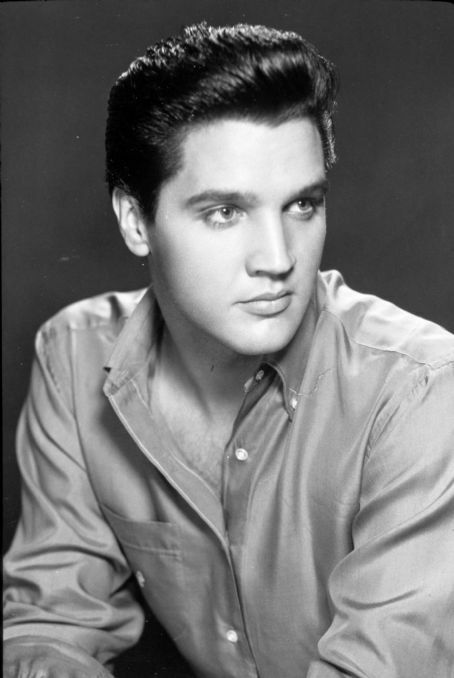 With some, including Johnny Cash, Buddy Holly, and Ricky Nelson, it’s obvious that he did. But how he influenced many others in the exhibit, such as Dwayne Johnson, Michael Bublé, Justin Timberlake, and KISS escapes me. I quickly passed through into the "Elvis the Entertainer Museum," billed by Graceland as “the world’s largest and most comprehensive Elvis museum.” Covering all aspects of Presley’s career, this amazing exhibition alone is more than worth the admission to all of Elvis Presley’s Memphis. 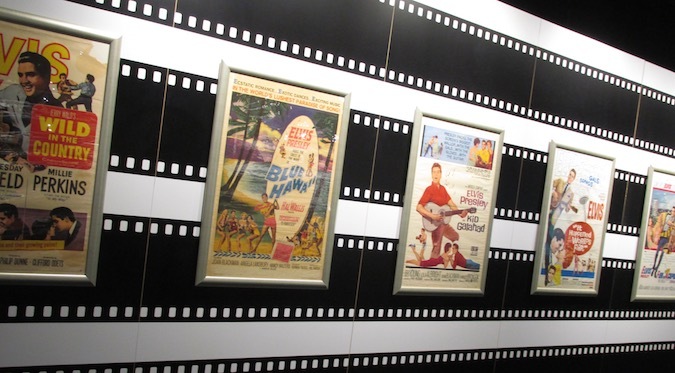 As an ardent fan of Elvis’s movies in my youth, I was happy to see that the museum gives due coverage to that aspect of his career. Large posters recognize each of his 33 films, and a video screen plays the trailers for all of them. 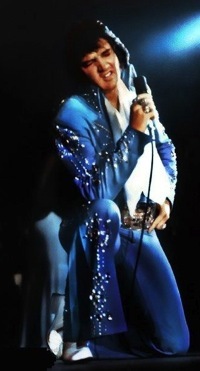 The ’68 Comeback Special gets comprehensive coverage, with three video screens showing highlights and three outfits, including the iconic leather suit, on display. 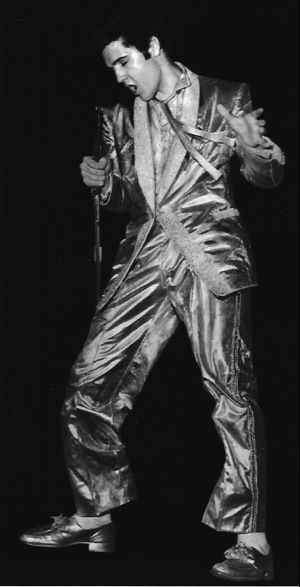 The gold lamé suit is also there, as are 18 jumpsuits from the 1970s. Contracts and other documents can be examined, and what seems like hundreds of gold record awards from around the world fill an entire wall. Scenes from the “Elvis: The Searcher” documentary play continually in a small, sixteen-bench theater. 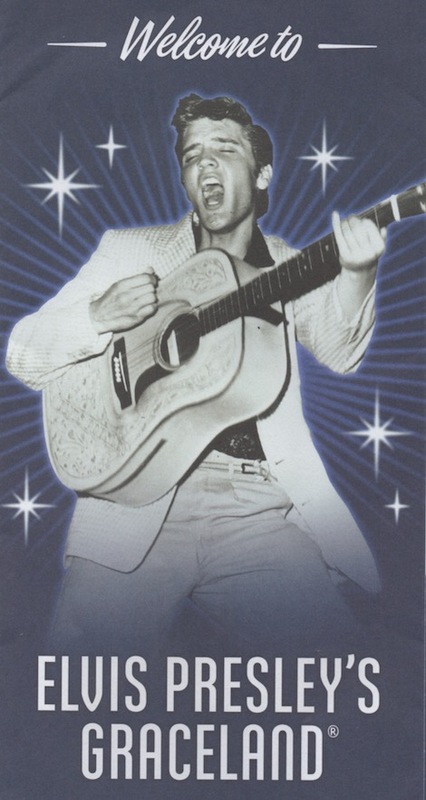 The museum is an Elvis fan’s dream to be experienced and remembered forever. It was impossible for the remaining exhibits to measure up to the excitement generated by the "Elvis the Entertainer Museum." 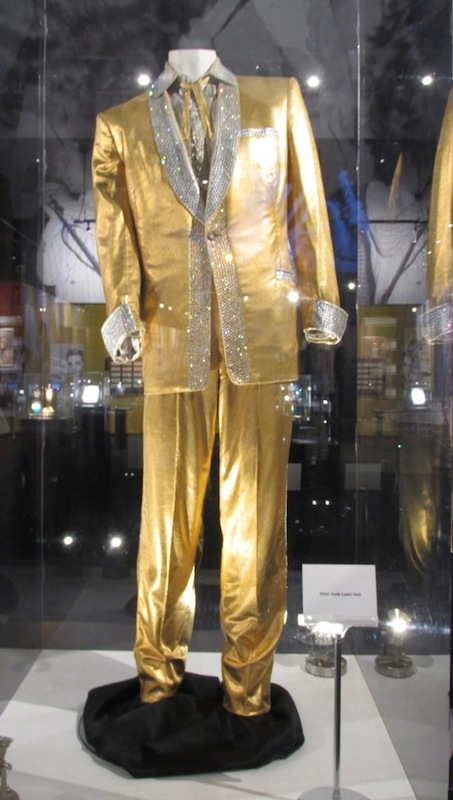 Next in line was the "Fashion King Exhibit,"" displaying a collection of items from Elvis’s personal wardrobe. 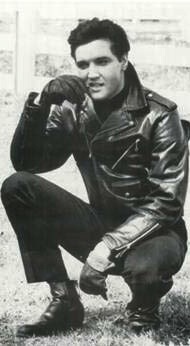 The title implies that Elvis was a driver of fashion trends, but I think it more likely he was an aficionado of current trends. Whichever it was, this exhibit of his personal clothing doesn’t stirs up little emotion compared to his iconic stage outfits. Next is Elvis’ Tupelo Exhibit." Photos and documents are available, but most of the space is taken up by a replica of Elvis’s birth house. Next is the "Hollywood Backlot" exhibit. Still under construction, according to Graceland, it “features the actual sets used in the CMT show ‘Sun Records.’” One gets the feeling that Graceland was merely filling up space with this one, and the same can be said for the next stop, "The Sam Phillips Exhibit." (A Sun Records shuttle takes visitors from the Guest House right over to the real thing a few miles away.) The final exhibit, "Hillbilly Rock: The Marty Stuart Collection," caters only to those with an interest in the history of country music. There’s very little mention of Elvis in it. After a busy day at Elvis Presley’s Memphis, I planned to get off of my feet and watch one of Elvis’s movies on Soundstage A, the complex’s new theater. A two-word sign reading, “Soundstage Closed,” torpedoed that plan. So, since our package tickets included them, we wandered over to tour Elvis’s airplanes. Walking through the part of the "Lisa Marie" that was open took less than 30 seconds, and all that is possible to do in the smaller Jet Star is to stick your head inside and back right back down to the ground. Skip the airplanes. 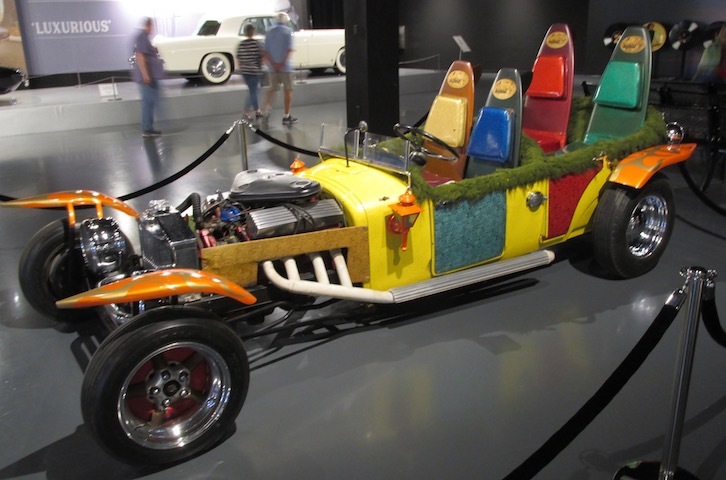 "Billed as 'the largest and most comprehensive Elvis museum in the world, 'Elvis the Entertainer' Museum covers all aspects of Presley’s career. 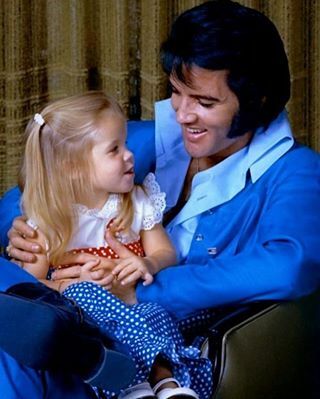 It's an Elvis fan's dream to be remembered forever."